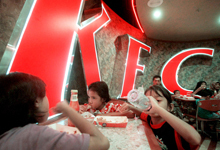 Young Malaysians eat at a KFC Restaurant in Kuala Lumpur. Yum Brands, parent of KFC and Pizza Hut, said on Nov. 30 that it expects a 4 percent year-on-year decline in fourth-quarter sales at its established restaurants in China. The company said a cooling economy made it difficult to exceed the 21 percent revenue increase it saw a year earlier. Half of Yum’s total revenue and operating profit for the third quarter of 2012 came from China. Chow Tai Fook Jewellery Group, the world’s biggest jewellery retailer by market value, on Nov. 29 reported a 33 percent fall in profit for the six months ended September to HK$1.82 billion, year on year. Same-store sales fell 1.7 percent over the same period, with mainland China revenue up 3.4 percent and Hong Kong, Macau and Taiwan falling 6.3 percent.